The event included immersive operatic experiences popping up, in and amongst the audience, without creating obvious dedicated spaces where the performances were to take place; this was always going to present design challenges. With a brief to deliver an opera experience as part of a marketing event for SAB Miller’s Peroni Beer, the Light Motif team designed the event. The event included bars with concealed staircases that transformed into stages and a custom made tensile structure, with custom designed projection mapping to cut the translations of the songs into the stars projected above. 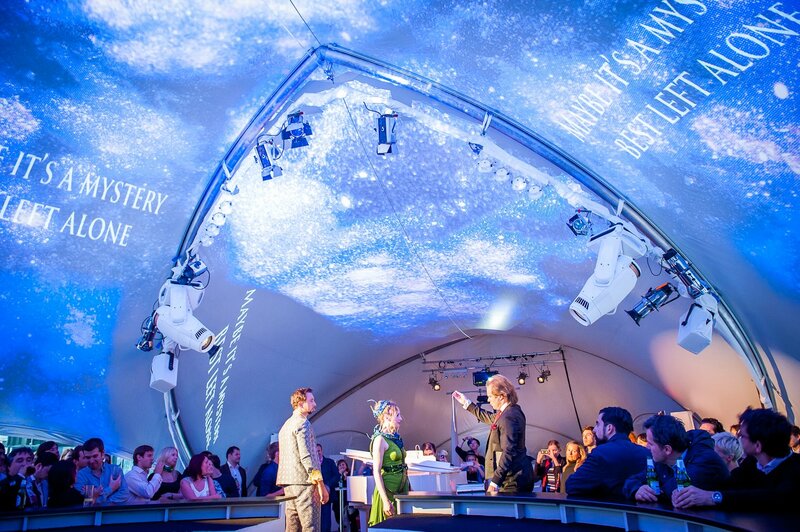 Over the evening, the ceiling transformed from a blue sky to a star field filled with operatic arias. Lighting was added to transform the mood throughout the evening, and to subtly merge the performances into the main space of the event.